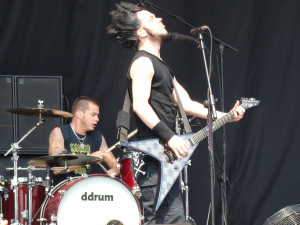 Wayne Static (born Wayne Richard Wells) was the frontman of Los Angeles’ band Static-X, which fused industrial and nu-metal music and released six albums throughout their years together before the members of the band parted ways in 2009, ending their friendship bitterly. The musicians who had been friends for over a decade hadn’t reconciled for the following five years. Wayne recorded his only solo album “Pighammer” and was getting ready with his wife to leave for a Fall/Winter co-headlining tour with Powerman 5000 and Drowning Pool, which was due to start on November 6. The couple was about to leave the night before on Halloween, but decided they would head out early in the morning November 1st. Instead, his wife of six years, Tera Wray, found him dead in his bed in the morning. Wayne died just three days before his 49th birthday. The official press release later said that although Wayne and his wife, former stripper, were known for heavy partying, they had left hard drugs in 2009 (the year Static-X disbanded) and had not touched them since. Tera Wray Static released the following statement: “Wayne was not taking drugs, if anything he was a drinker, and did not OD. The autopsy will be done by this weekend at the soonest, however for some of the test results it will take up to 6 months to get the actual death certificate finalized… Static’s first solo album – Pighammer – was a tribute to his new non-drug life and hoped it would help others to get clean from hard chemical drugs”. The true cause of Static’s death isn’t known until the official autopsy report. However, it is not a secret that heavy drug and alcohol use in the past can cause permanent damage and result in sudden death later on. “We can all have opinions as to why – We all know that both Wayne and I had abused narcotics with alcohol in the past, which I am sure took a toll on his body, heart and soul”, – Wayne’s wife admits. I’m having a hard time finding the words to express how I feel right now, and it’s taken me a long time to even try to write something. I knew Wayne for 15 years. Some of the best times of my life were with him. I considered him a good friend. It’s sad, the way our friendship ended, but even more sad that we never got to settle things between us. Even though we were no longer friends the last five years, I held on to a sliver of hope that my old friend would come back. We were like family: Koichi Fukuda, Nick Oshiro, Erik Fincher, Bruce Reiter, Brandon Webster, Dinkus Maximus, Royal Jensen; we all just wanted our old friend back. Sadly, that’ll never happen. I feel so horrible for his parents and his brother and sisters. I can’t even begin to imagine what they must be going through. My deepest condolences go out to them. All we can do now, is remember the good times we all shared. Rest in peace Wayne. I am still trying to process the sad fact that I’ve lost my dear old friend, Wayne Richard Wells. He was an extra ordinary, one of a kind, very special person and also a very gifted artist with a clear vision. On a personal level, he was a smart, kind, caring sweetheart and soft-spoken gentleman. I really loved his dark, biting and sharp sense of humor. We all shared so many great times and also some tough times together like we are “Family”. It makes me so sad and angry at the same time that I’ll never have a chance to reconcile with him. I thought the time is the only thing needed for all of us to realize what we had is something so special. I was just waiting patiently for my old friendWayne to come back and hoping someday we’ll play music together again in a same room with a smile on our face and have fun like old times. I’ll miss that special chemistry between the four of us forever. My heart is breaking for his parents Richard and Darlene Wells and also his brother and sisters. They are the sweetest people I know. My deepest condolences go out to them. Rest in Peace, Wayne. Thank you for everything. You will be missed by so many people including me.